Arby's may play to an older audience than other fast food chains, by it doesn't need a play-place to have a good time. 1. THERE IS NO "ARBY." The name is a play on the letters 'R' and 'B.' And despite some claims that it’s an ode to their classic sandwich, it doesn’t stand for “roast beef.” Rather, RB stands for Raffel Brothers, a nod to founders Leroy and Forrest Raffel, who opened the first Arby’s in Boardman, Ohio, on July 23, 1964. 2. IT COULD HAVE BEEN CALLED "BIG TEX." It’s not clear why—they weren’t in Texas and didn’t serve distinctly Southwestern food—but that was the name the brothers originally had in mind. There was already another business in nearby Akron, Ohio with that name, however, so Arby’s it was. 3. THE ORIGINAL MENU WAS VERY LIMITED—AND SURPRISINGLY EXPENSIVE (FOR THE TIME). The brothers weren’t exactly sure what sort of food they wanted to serve when they left their jobs as restaurant equipment suppliers to follow the fast food trend. They were inspired late one night at a summer beach resort in Massachusetts. Even though it was dark and rainy, people were waiting in line for roast beef at a place called Kelly’s. The Raffels decided roast beef was the perfect open niche in the current fast food landscape. But while McDonalds was selling hamburgers for 15 cents, Arby’s roast beef sandwiches—one of just a few things on the menu—was more than four times that amount, at 69 cents. The brothers hoped that slightly higher-end restaurants would attract more of an adult crowd. 4. HANK AARON OWNED A BUNCH OF ARBY’S FRANCHISES. 5. THEY’RE PRETTY HEALTH-CONSCIOUS, FOR A FAST FOOD CHAIN. You might not think of Arby’s as the most nutritious place to dine out, but in the ‘90s, the company was first to make a couple of healthy changes. In 1991, it became the first fast food chain to debut a “lite” menu, featuring a series of salads with less than 300 calories. And in ’94, Arby’s became the first chain restaurant to ban smoking in all of its locations. 6. …BUT THEIR BEST SELLING NEW PRODUCT IS A BRISKET SANDWICH. The menu has grown significantly since roast beef was the only sandwich available, and some additions have been more successful than others. According to Arby’s, the most successful new product in over 50 years of restaurant history is the smokehouse brisket sandwich, which they first introduced in the fall of 2014. The smoked brisket, smoked Gouda cheese, barbecue sauce, and crispy onions combo lifted “year-over-year same-store sales” more than 12 percent during the promotion. 7. WHEN ARBY’S ADVERTISED ALL THE MEAT ON THEIR MENU IN ONE AD, PEOPLE WANTED IT ON ONE SANDWICH. As the menu evolved, Arby’s needed to advertise options beyond roast beef. To alert customers to the many protein offerings, Arby’s hung mouth-watering posters featuring the many meats on the menu—chicken tenders, roast turkey, ham, corned beef, brisket, Angus steak, bacon, and the old standby, roast beef. “People started coming in and asking, ‘Can I have that?’” Christopher Fuller, the company’s vice president of brand and corporate communications, told The Washington Post of the ad, which showed all of the meats stacked neatly on top of each other. The so-called “Meat Mountain” isn’t on the menu, but if you ask for it by name, the folks at Arby’s will put all that meat—plus Swiss and cheddar cheese—on a roll for you, for just $10. 8. THEY HOLD THE WORLD RECORD FOR LONGEST COMMERCIAL. Last year, to prove that the smoked meat in their Smokehouse Brisket LTO sandwich is really smoked for 13 hours, Arby’s aired a commercial showing the whole process—all 13 hours. Viewers tuned in for an average of 39 minutes—not bad for a fast food commercial, considering television viewers sometimes can't make it through a 30-second commercial without fast-forwarding their DVR. The Guinness World Record-breaking ad actually played in full on a Duluth, Minnesota channel on a Saturday. To top it this year, the company gave out 500 six-DVD box sets, with all 13 hours of meat smoking plus a bonus eight hours of turkey action. Riveting. 9. ARBY’S BOUGHT PHARRELL’S HAT. During the 2014 Grammys, Twitter was abuzz with the idea that Pharrell Williams’s hat—a Vivienne Westwood design—looked an awful lot like the Arby’s logo (it even spawned its own Twitter account). After the show, the singer put the hat up for sale on eBay and Arby’s bought it for $44,100. All of the money was donated to children's charity From One Hand to Another, which helps kids learn through technology and the arts. 10. 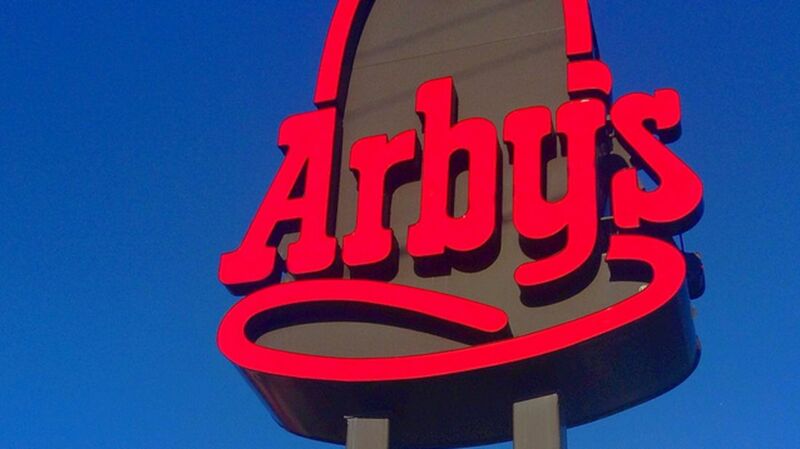 ARBY’S SOLD TONS OF FOOD OVER HALF A CENTURY. All those sandwiches have added up. Since the first Arby’s opened in 1964, they’ve sold 5 billion classic roast beef sandwiches, 3.34 million pounds of corned beef, and about 1.37 million pounds of sauerkraut. And, presumably, gallons upon gallons of horsey sauce. 11. ARBY’S HAS A LOVE/HATE RELATIONSHIP WITH JON STEWART. When Jon Stewart first started bashing the chain in 2013 on The Daily Show, executives at Arby’s were initially worried about the bad press. But pretty quickly they decided to roll with the punches, sending the Daily Show team a platter of sandwiches later that year and really embracing their “rivalry” when Stewart announced his retirement. The fast food chain featured prominently in the host’s final week this August, sponsoring an entire episode, airing custom commercials, and even sending their chief executive to appear in a taped send-off segment in the finale. In Stewart’s honor, Arby’s even introduced a secret, off-menu item called the Daily Deli: a double corned beef on rye (Stewart's favorite). Awww.